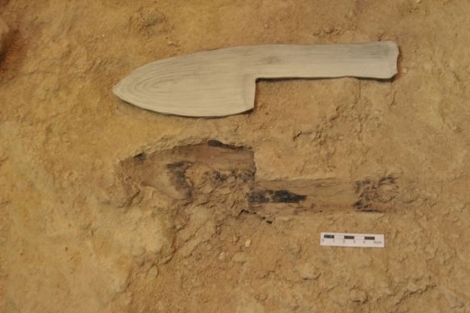 The almost hollow print of what once was a trowel (or similar) has been found at the Paleolithic cave of Abric Romaní (Capellanes, Catalonia). The print came with some residues which indicate that the instrument was left at the fire when it was already off, so it did only burn superficially, later being deprived of oxygen by water and moss. The artifact's length is of 32 cm, with a maximum width of 8 cm and may have been used to manage the fire. It is dated to 56,000 years ago.